Kevin Lynch wins this tackle for the Blues against St. Pats at the RSC on Friday night last. 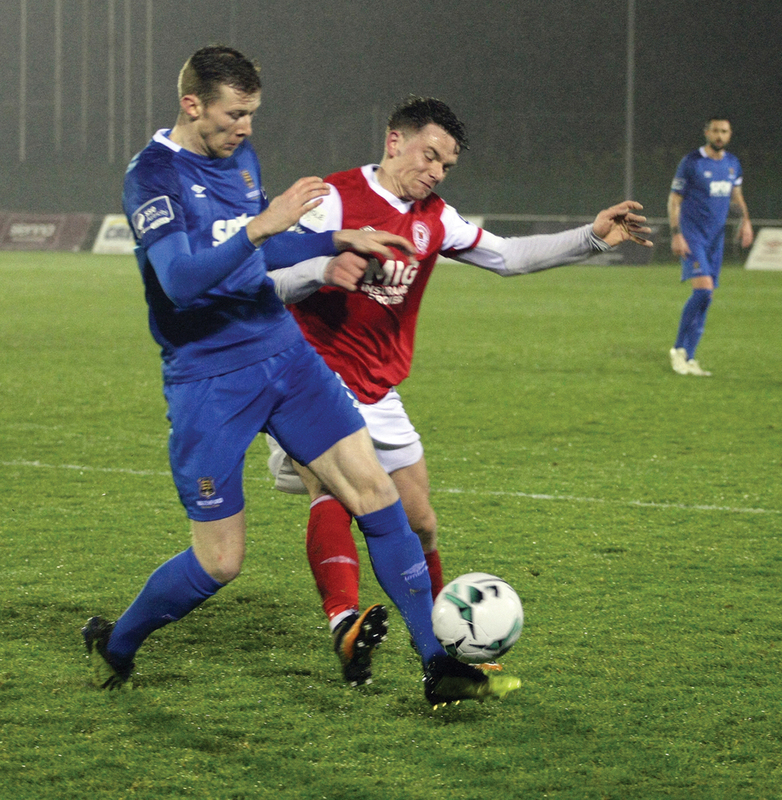 Waterford FC put three vital points on the board as they St. Patrick’s Athletic played in front of a 2013 attendance at the RSC on Friday night last. Aaron Drinan scored twice for the Blues in a most entertaining match. St. Pats had the first chance of the game on 3 minutes, Jamie Lennon played the ball ball out to the right for Dean Clarke but his effort was cleared off the line by Maxi Kouogun. Minutes later Matthew Connor made a fine save with his legs to deny Chris Forrester. The Blues had a chance on 5 minutes when JJ Lunney picked out the run out on the left of Scott Twine but his effort was saved by Brendan Clarke. The Blues had a great chance to open the scoring on 13 minutes when an excellent move saw Scott Twine slip the ball into the path of Zack Elbouzedi out the right and his cross was missed at the far post by Aaron Drinan. It was Drinan who opened the scoring the lead five minutes later. Kevin Lynch whipped in a left wing cross and when St. Pats failed to clear the Waterford striker headed past Brendan Clarke from 10 yards. The Blues should have doubled their lead on 40 minutes, Aaron Drinan headed the ball into the path Zach Elbouzedi but his close-range shot came crashing back off the near post. Drinan should have added his second goal of the contest within in the first minute of the second half when he rose unchallenged to meet a Shane Duggan cross but the striker headed over from six yards. Just past the hour mark JJ Lunney forced Brendan Clarke into a fine save when he fired in a shot from 25-yards. Lunney then set up the second Blues goal on 62 minutes, he raced clear of the St. Pats defence before slipping a delightful pass into the run of Drinan who scored from close range. The visitors did have the ball in the back of the Blues net on 67 minutes when Brandon Miele cracked in a shot that came back off the post into the path of Mikey Drennan, who finished past Matthew Connor ruled the goal out for offside. Drennan went close once again to pulling a goal back for the visitors ten minutes later when he raced to the near post to meet a Simon Madden delivery from the right, but he couldn’t direct his header on target. Izzy Akinade had an effort deflected wide two minutes after coming on as a substitute on 83 minutes.Then Akinade burst into the box on 86 minutes but a sliding tackle from St. Pats defender Lee Desmond denied Akinade a late goal.